Packing a real aerodynamic punch, the legendary Kask Protone Road Helmet might look traditional, but it’s ingenious shaping and ventilation is what leaves the competition in its dust. Extensively pushed to its limit in the wind tunnels by Team Sky, air passes over and through the Protone with ease, while also bringing the added benefit of extensive breathability and sweat wicking at the same time. 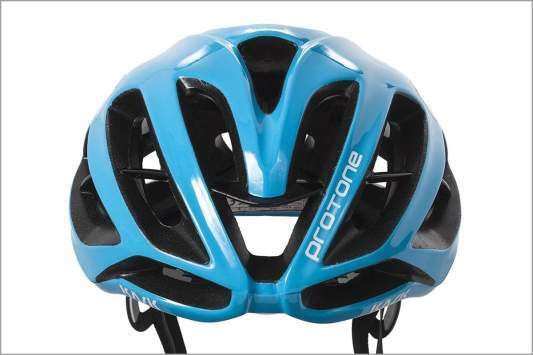 What’s perhaps most astonishing here is the fact that the Protone weighs in at just 230g, despite featuring some of the most effective helmet padding on the market. Based on an innovative multi-layer open cell construction process that gives maximum comfort and performance, this helmet is made from Coolmax® technology to boost both its breathability and sweat-absorbing and it reduces head-to-pad contact by up to 70%. As for safety, which is why you’ve come to Kask, the brand have continued to use its Multi In-Moulding Technology to create a polycarbonate cover for the top, base ring and the back of the helmet’s shell. This is joined to the inner polystyrene cap via KASK’s In-Moulding Technology to improve the shell’s shock absorption. Its strengthened frame further reduces the risk of a shock breaking the shell. Finally, the top area is reinforced with an internal plastic sub-structure that increases crash protection and helps maintain the helmet’s integrity after impact. Rounding proceedings out impressively is an eco-leather chinstrap that works hard to prevent skin irritation, there’s a self-adjusting lateral divider for a comfortable and ergonomic fit for all head shapes and sizes and there’s even a bag thrown in for good measure. Believe the hype: the Protone really is the complete package. 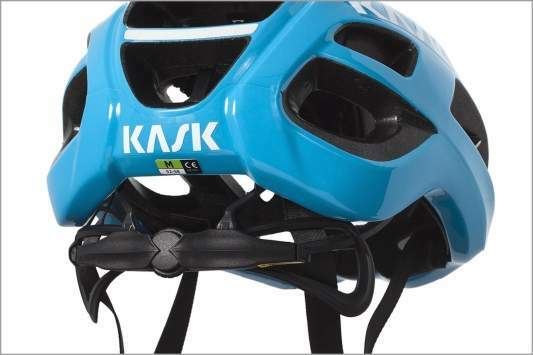 Kask Protone Road Helmet is rated 4.6 out of 5 by 149. Rated 5 out of 5 by JanD97 from Excellent Excellent quality and comfort. Nice and light with good air flow but not too exposed. Nicely adjustable at the back and great that you can remove the pads for washing. Highly recommend to anyone wanting a high quality helmet. Rated 5 out of 5 by vwvw from Great fit and comfy Bought a few weeks ago great comfortable lightweight helmet. Adjustable height easy to use and ensures good fit.. Minimal looking with plenty of colour choice. Hardly notice wearing it . Can't fault it. Rated 5 out of 5 by Jimstert from Great fitting Nice quality feel , good size / fit and comfortable. Rated 1 out of 5 by NeilDob from Not a great fit and loose adjusters I have worn Kask helmets for the last few years and been delighted with them. I was really disappointed, therefore, that this version did not meet my expectations and, after wearing it a few times, I have had to return it. Firstly, i found the fit not as comfortable but the main issue was with the sliding adjusters at the back. They were quite loose and I found that when riding they would slide further open to the point where one of them was digging into the back of my ear and causing abrasions. I tried different ways to hold it in place but it didn't really work and then one of the parts that hold the strap in place fell off (after about a handful of uses). Shame as I thought I would love this lid and, for the price, I expected great things. My head circumference falls between 58-59cm. Can I still wear a size M? I'm 58.5cm. I'm using the M and can even fit a cap underneath. Does the helmet come with a bag? You will get a helmet bag with the Protone. Can you fit a cycling cap/skull cap under this helmet? You should be able to as the helmet is adjustable. When will large size helmets be in stock? no where outside of Italy appears to stock large, kask recommended ordering from an Italian site. The red on the white/red helmet looks more orange. Is this just an issue with the image capturing? Kask list a small size on their website so bought one from another retailer that stocks them! I would suggest that the large would be best for you. What should be the size for an Asian head of 54 cm? The medium would work best for you in this helmet. Hi is there an option to get this in Matte black the option that just says black looks matte or satin but what is the finish actually like ? I am after a matte finish. I have no idea about the black, but Ive seen someone with the Matt dark Blue and it looks really good! Is light blue under the blue? As I don't see option for light blue. If you scroll down the list of colour options for this helmet you will see Blue listed as an option.